Do you think you have Peroneal Tendonitis? 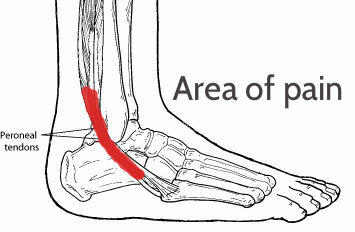 The two peroneal tendons(A tendon is a band if tissue that connects muscles to bone) in the foot run side-by-side behind the outer ankle bone. 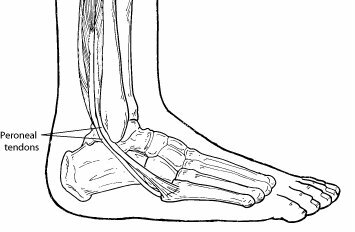 One peroneal tendon attaches to the outer part of the midfoot, while the other tendon runs under the foot and attaches near the inside of the arch. These tendons are important because they balance the ankle and the back of the foot and prevent the foot from turning inwards repetitively. They are a bit weaker than the muscles and tendons on the inside of the ankle and are prone to injury as the ankle turns, rolls or becomes sprained. Tears of these tendons do occur. One or both of the tendons can be torn. This leads to swelling, pain and a sense of instability behind the outside of the ankle. Occasionally the tendons can be injured. Peroneal tendon injuries may be acute, where it occurs suddenly or chronically, where it develops over a period of time. They most commonly occur in people who are very active, where the exercise involves repetitive ankle motion. Runners who run along slopes which causes excessive rolling out of the foot. Having a tight calf muscle will increase the tension in the peroneal tendon causing it to rub more. Ache above or below the outer ankle bone, which can happen during or after running, at night, or when you wake up in the morning. 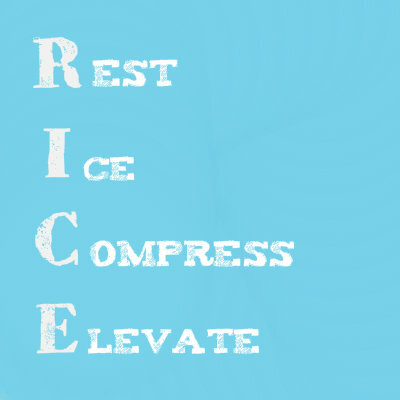 RICE!!! REST is extremely important with this injury, as it is most commonly cause by overuse. Ice keeps the swelling down, and the compression keeps the blood flowing to preventing from swelling. Try wrapping some ice packs around the area of pain and prop your foot on some pillow and lay down for about 25 minutes at a time a couple times a day. Using a NSAID’s (non steroidal anti inflammatory drugs) like Aleve or Advil can help ease the pain and reduce the swelling. Make sure to consult with your Doctor before taking these. While sitting in a chair, lift your right leg and gently place your outer right ankle on top of your left thigh. After bending your ankle so your toes point down, grasp your foot with your left hand and turn it so the sole of your foot points up. You should feel a nice stretch on the outer shin, hold for 30 seconds and release slowly and switch. After placing the balls of your right foot on the step, hook the top of your left foot around the back of your calf. Lower your heel toward the floor until your toes point up. Hold for 30 seconds, slowly release and switch. 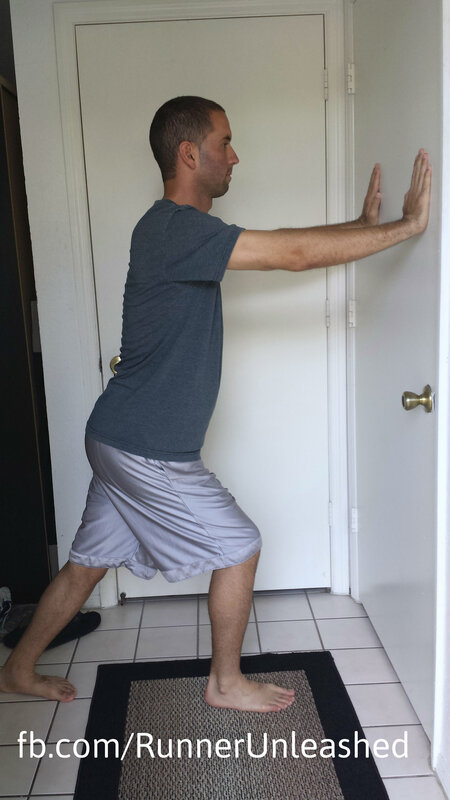 The wall stretch lengthens your peroneals and calves. While facing a wall, stand with your feet in a staggered stance and position your hands on the wall. Keeping your back leg straight, turn your foot inward slightly and bend your front knee. Lean forward and you should feel the stretch on your back leg. Hold for 30 seconds and switch legs. Getting a deep tissue massage would also be beneficial as it can help reduce the tension. Now I know what that pain is in my lower lateral leg. Thank you for the great article!! Question, it seems like I have this issue and the swelling is gone, the only thing is that there is a discomfort when stepping with my right foot. I am runni g a marathon in 13 days, what can I do to to aliviate the discomfort for the big day? Where exactly is your pain? On the bottom of your foot? When I step with the right foot and add weight or preassure as it propels forward. I do want to run the 1/2 marathon next Sunday but will need extra ankle and Achilles support. What is your recommendation and suggestion? Hey Hugo, being that your race is so close, I recommend trying KT Tape. Stretching your plantar fasciitis will help ease the pain, as you have ligaments and tendons that run from your heel to your toes. Try sitting on the floor with knees together in front of you and sit on your heels behind you. It stretches and eases the pain right away. Thank you, i will be using Ktape and compression socks. One last question, I will have the option to switch from full to 1/2 marathon, should I do this or stick to the original goal ? Will I be able to achieve this with the discomfort on my right ankle? I also have been having this issue for 7 months. I have used ktape and gone to 2 doctors. I also have custom orthodics and still no help. I also have a brace that i use every now and then. It slightly swells up after 10 to 15 minutes of walking and i feel pain when i left up. Do you have any other suggestions? I am currently getting treatment from a sports chiropractor for muscle stripping just to relieve tension for the peroneal tendon. Hey Aaron, what a shame you are dealing with all of this and nothing seems to help. I’ve been there before and know the frustration. Do you know what causes the pain? What are your therapist telling you to do? my Therapiest had me do some ice bath 4 times a day and go do light jogging. At this point i don’t think the jogging is in the books. He said a few more treatments would dramatically help. The cause of the pain stems from an knee injury which my knee locked up and i was walking downstairs leaning towards my right foot and twisting my ankle while walking downstairs. I am currently trying to wear the compression ankle sleeves all day to see if it improves. The streatch that is shown above for sitting on the chair and using the left hand to lift the ankle. Do you push down on the ankle while using the left hand to push up? I wasn’t understanding putting both knee together and sitting on the ball of your foot. Is there any illustration of it or can you elaporate more. thanks. I need to get well cause its so aggravating. I am 66 years old And suffer from chronic Perineal tendon pain. Not the athletic type am ia candidate for surgery? hhmm I am not sure on that Roger. You might have to check with your Doctor on that. This was very informative! I believe I have diagnosed myself with peroneal tendinitis from reading this article and a few more online. I’m going to see a podiatrist tomorrow to find out how bad it is because I am running BOSTON in 3 weeks. When I roll my left foot out (especially when I flex it), I feel pain. I do not feel pain walking or running (I did my 20 yesterday… didn’t feel a darn thing the whole time!). This pain I felt started almost a week ago. Hopefully it is not TOO bad since it does not hurt when running, only when I roll out or flex and roll out… But I do plan to REST until it is gone… I do not it to get worse and I do not want to run a marathon in pain! Hi, i believe i have this condition on my right ankle as well. Now the pain had gone up to my knee and I limp when I walk from the pain and limited in motion. I’m a minimalist runner for five years now and never had this injury, even when I first transitioned. I have a mudrun coming up in about a week. I’m debating between maintaining my workout for the event or rest it out til the event to heal. I would hate for this injury to prevent me from doing the event. What are your recommendations to improve my condition with the time I have left til the event, and during the event to finish with minimal pain? Hey Brian, since you are so close to your event, at this point all you can do is try to treat it with ice and rest. What event is it? You can try KT Tape to help you get through now and the event. But if your pain is too severe or has more doubts, you might have to sit this one out. Especially since you limp when you walk, and it has gone up to your knee. Have you seen a Doctor? Thanks for the response. The event is the Merrell Mud Run Los Angeles. Nothing serious, but it’s my first. I have been running for a while but unfortunately incurred this injury last week, of all the times. I tried to contact my doctor, but he can’t see me two weeks from now and the mud run is this Sunday. and found it very interesting. Check out this book if you haven’t already heard of it. So I had my leg massaged yesterday and turns out that my ankle was swollen and I didn’t even notice it. She says there’s a pinched nerve and the swelling was spreading. I pray that this will speed up the healing, but I have to say, I feel a significant improvement from yesterday. It’s frustrating to not be able to run or workout with only a week left. I’ll let you know the outcome, but I have every intention to make the event. We’ll see how it goes. Ok. Well just be smart about it. Don’t make it worse. Good luck and keep me posted. So I finished the event and it was a lot of fun, so much that I signed up for the Tough Mudder this Oct. Regarding my foot, it was holding up and I was gaining confidence after every step until about half a mile. Lol! My foot said he wasn’t having it. It was like running on a peg leg, but I jogged and limped my way to the finish line and it was a blast. For the most part, the obstacles didn’t hold me back with my foot injury, it was more from trying to run and hike, especially on the down hills. I know it wasn’t the best decision, but I knew and accepted the fact that if I kept going, I wouldn’t be able to use my foot for a while after the event and will need some time to heal it. So far, my foot is ok. I’ve been wearing my compression sleeve and socks every day. I still limp when I walk but it’s healing. I will also be seeing my massage therapist frequently so help heal the wound. How long do these injuries usually last and how soon can one start running again with the treatment of RICE? Awesome Brian! Glad you muscled through it! And tough mudder is no easy event!!! So congrats on deciding to do that! =) Keep in mind I am not a professional and I honestly wouldn’t know how long it will last as I don’t know the severity of your injury. Maybe taking some time off (a couple weeks) might help it heal. Have you seen your Doctor yet? Hi Runner Unleashed, I think I’m getting pain related to this. When I run uphill, my whole group of lateral lower leg muscles (peroneals) get so tight and flared up. Then when I go back downhill, I get sharp pains along these muscles. Not by my ankles, but about 1/4 of the way up between my ankles and knees, on the lateral aspect. Is this peroneal tendonitis? Any experience with this? This thread has been helpful, I have the same injury, the side of my foot has a fairly constant dull pain (only 2 or 3 out of 10, but it is there most of the time) and the tendon is also sore at the top, near the knee – so I am confident it is the tendon and not a stress fracture. I have the Brighton Marathon in 6 days! It is my 6th marathon and training has been good and I really want to run, but I don’t want to make the injury loads worse and end up needing months out. To add to my issues, I have used the same make/model of running shoe for around 4 years, I have been through 5 pairs of the same ones over this time, when I first had them I needed a pretty high arch in the shoe to compensate for my running style. However, I had a fresh gait analysis done yesterday and my running style has changed quite a bit and they said I didn’t need trainers with such high arches in, I think my ongoing use of the (wrong) trainers, combined with increasing my miles in recent months has caused this injury. So, I also have a brand new pair of trainers to run a marathon in, I haven’t even done 1km in them, so I am wearing them all week at work to try and break them in, not ideal. I have been icing, stretching, having physio and even invested in an ultrasound machine and the injury is improving day by day, hopefully by the end of the week it will be well improved and give me more confidence about running with it. My ideal would be to run the marathon, then maybe take a week or two out of running to fully recover from the injury, but I dread the thought of any longer. Or, should I not run and rest for a few weeks instead…. I’m having the same kind of pain on the outside of my ankles. I only feel it when I go from running to walking when I do intervals. I’m overweight if this can have something to do with it. I like to do intervals, but the pain I get is almost unbearable. It hurts when I walk after my workout, but after some stretching, I don’t feel the pain anymore. Any ideas on what I can do to help the pain during my workout? It’s not hurting me when I run. If doing intervals causes you pain, maybe you should back off of them for a bit until the pain subsides. Or just take a break from running until you recover. Thanks for the answer. The pain doesn’t feel like something is breaking in my body. It just feels like muscular pain, or my tendon. I tried to do strength training every day to take a break from the running, but it was too boring doing the same every day. My knees are hurting me on the bike, so I feel a bit out of options when it comes to my cardio. 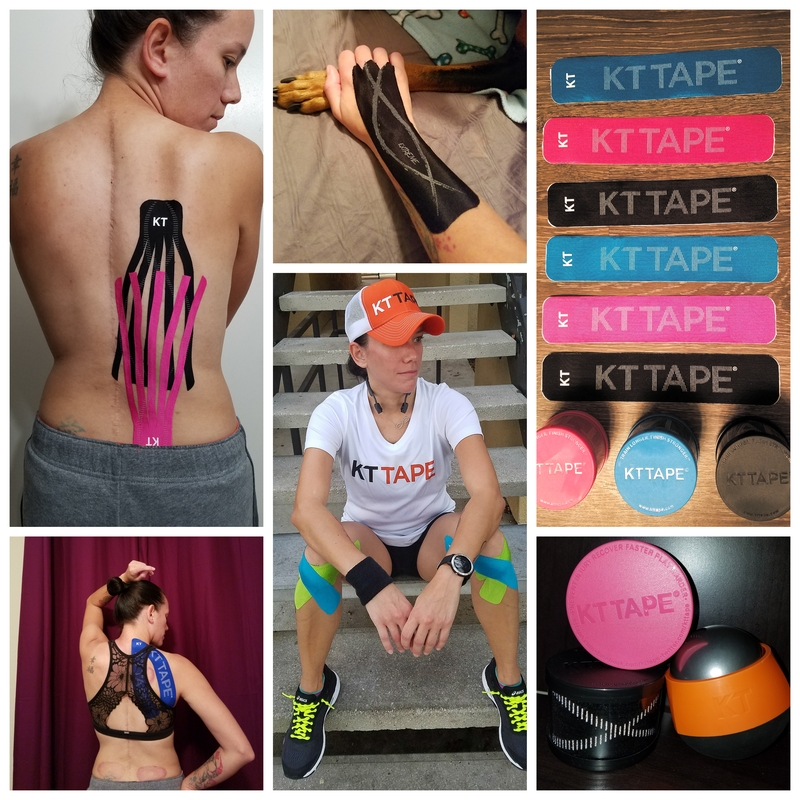 Have you tried KT Tape for it? I’ve been diagnosed with this before, but it keeps coming back 😦 I have a 5k to run in a few days, but I keep finding myself limping with it. I’m going to try KT tape, but wondered if you had any other advice. I’m sure you’ve outlined my condition here. I just started running in New Balance Minimus (barefoot style shoes) and I feel great but for the ankle pain later in the day, and usually on into the next day. I was doing absolutely no running previous to this (not for a few years at least), and since I’m really enjoying running, I don’t want to stop now. Can this condition improve even if I continue running? Yes it can worsen with time. But you can treat it and keep it from worsening with tape and such. I am having sharp stabbing pain right behind my ankle bone…it doesn’t happen when I run, but more when I am standing on that foot for an extended period of time or laying on my back in bed…I have cut back on my mileage and I took most of a week off. I also got new shoes. It had gotten better, but after this weekend (6 miles and two days of golf) it is back and is sore all the time now. I haven’t had the stabbing pain, but it feels achy on both legs (same spot). Any suggestions on how to rehab without stopping running all together? Have you tried icing it and stretching it? If not try not running for 3 days and see how it feels. You do need to give it a rest otherwise you’ll just do more damage and you’ll be out of running for months. Have you gotten it checked out? It will be tough to run a half marathon with this. You could be doing more damage. I have no idea how bad your pain gets, have you tried running? My daughter has this pain in the ankle and its stiff in the morning and when it first started it was sore until she warmed up, it has become worse where it is more an more Painful.She has stopped running and is only spinning, but this will be of no good as she is a referee. She went to a podiatrist who looked at the xrays saw nothing and injected her with cortisol, It is now 3 weeks and it is back with a vengeance, she went to a sport Physio who is doing shock treatment and massage therapy she thinks it could be the calf muscle that is to tight and creating this problem. She has 4 weeks where she could rest from running now and only do spinning and swimming. I have come to the conclusion this injury is overuse and football boots which were mad for speed and not agility, I have seen that asics boots have a 10mm lift in the heal would this help. A docter at the tournament thinks it could be planter fasciatus and the pain is showing it self on the peroneal and achilles. I am at a loss it is like a lottery at the moment. 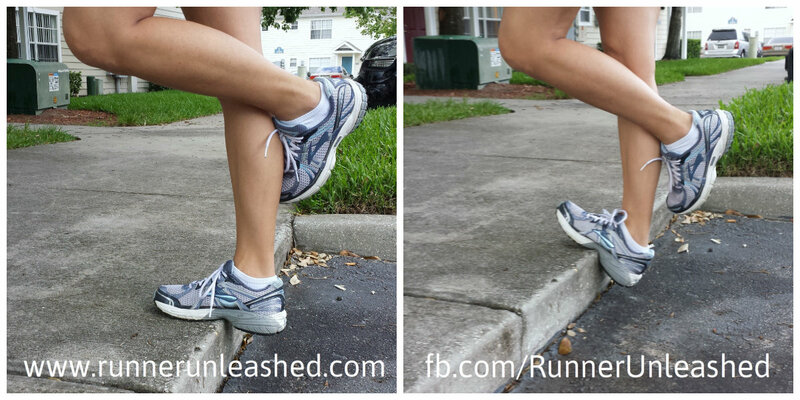 Previous Previous post: Prevent shin splints. Next Next post: There is KT Tape for that! !